For every club there is that one important event in the year for which preparation lasts the entire season. For our club this is the World Cup. We chose the Italian round for many reasons: nice weather, good location by the sea and a chance to visit Venice for a free days before or after the event. This year the competition took place on the 23rd through 24th of March. 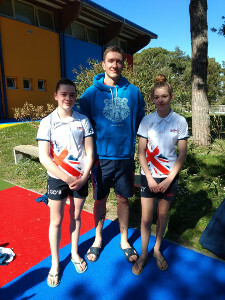 It was the third appearance of Neptune Finswimming Club at this World Cup round. Due to school exams some of our squad members could not attend the competition and therefore we had to go with just two competitors, likewise this was the youngest team that we had ever taken to the World Cup. Two girls, Zena Yfimcev and Grace O'Brien, both 12 years old, were representing Neptune at the highest level. Both Zena and Grace have been training with our club for more than a year now. 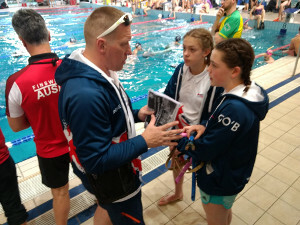 Along with other team members they have been successfully participating in domestic competitions achieving very solid results: Junior National Records and records in their age group. 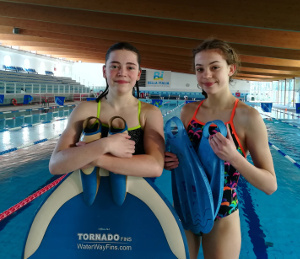 Just a week before the trip to Italy, Neptune participated in the finswimming championship in Chester, where our club broke 11 National Records and many records in the various age groups, with significant contributions from Zena and Grace. So far the girls have different specialities in competition. Grace is focusing on the monofin events (called surface in finswimming terminology), whereas Zena excels in bi-fins races. In Italy Grace chose to swim 50m bi-fins, 50m surface and 100m surface, and Zena decided to go for 50m bi-fins, 100m bi-fins and 200m bi-fins. This year the Italian round of the World Cup attracted more than 600 top level finswimmers from the countries where this sport has been practiced for more than half a century. Our girls competed in the U18 category against the best of the best. The majority of the athletes in this category were much older than our team. The competition itself ran over two days: Saturday and Sunday. Each competition day was split in two sessions - four sessions in total. Each swimmer can only score points in 3 races. For Zena and Grace the first session was free and they had a chance to observe how everything happened, whilst making friends with the top finswimmers from other countries. In the second session the girls were in action for the first time with their 50m bi-fins. And, well, they delivered! A PB for Zena with 26.09, and Grace's 25.08 narrowly missed the National Record by several hundredths of a second. The next day, more races. Picking up experience of competition on such a high level, the girls swam more and more confidently, which was reflected in their results. In the next session Grace swam the 100m surface with 49.07 - a National Record. Zena also followed through, setting a National Record on the 100 bi-fins with 56.22. In the last session Zena and Grace flew through their distances again and broke two more National Records, this time with Zena on the 200m bi-fins with a time of 02:06.55 and Grace on the 50m surface with 20.94. In total 4 National Records, the girls reached the top 20 places in the U18 category, with around 50-70 competitors racing each event. Unofficially, among the competitors of their age they were in the top 3 in every race. Great achievements by two talented 12 year old girls. The rest of the Sunday was spent on the seaside. Now the tough work was over and girls dipped into the sea making the most of their trip, while the locals were walking on the beach in their warm hats. Time to have some fun and rest before coming back home.